Guests staying at our Sandwich Inn begin their day with a delicious, healthy, and hearty breakfast each morning. During this time, they chat with other guests about places they have visited during their Cape Cod vacation. Innkeeper Charlie provides information as well and offers maps and directions to help guests plan their day. In earlier blogs we have, hopefully, given you helpful information about the Upper Cape, Mid Cape, and part of the Lower Cape. 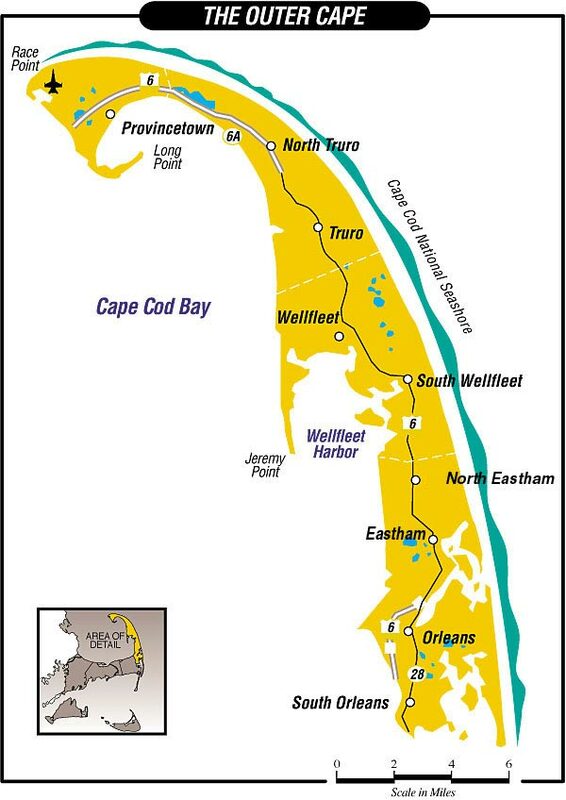 This blog is actually Part 2 of our Lower Cape series and covers what some folks refer to as Outer Cape Cod; the villages of Orleans, Eastham, Wellfleet, Truro, and Provincetown. You may read articles that do not include Orleans when referring to the Outer Cape, but for the purposes of this blog, we are including it. 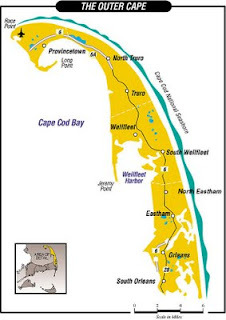 This part of Cape Cod extends out into the Atlantic Ocean, bordered by the ocean on the outer or eastern side and Cape Cod Bay on the western side. The drive north from Chatham along Route 28 (although the signs say 28 South), is along beautiful Pleasant Bay. The views are breathtaking. This route will take you up to Orleans. This area of the Lower Cape from Orleans to Provincetown (the Eastern facing part of the Cape) is sometimes referred to as the “Outer Cape.” It includes the Cape Cod National Seashore, a national park comprising much of the Outer Cape and the entire western side of the coast. Located along here are some of the most popular beaches in the United States. The town of Orleans is nestled between beautiful Skaket Beach on the Cape Cod Bay side and Nauset Beach on the ocean side. Why this town is the only one on the Cape with a French name, (most have their origins in England) no one really knows. It was the where the first cable between the US and France ended and is home to the French Cable Station Museum. On the Cape Cod Bay side of Orleans, you will find Rock Harbor. If you yearn to fish off Cape Cod, this is a great place to hook up (pun intended) for some charter fishing. The quaint town center has lots of shops and galleries as well as wonderful restaurants where you can enjoy an abundance of fresh local seafood. In the historic district you can explore the history of this wonderful village. 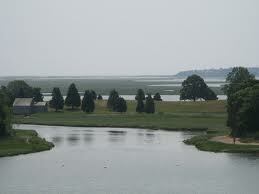 And….lets not forget East Orleans with its beautiful Nauset Harbor and Nauset Marsh. This marsh is one of the most productive salt marsh habitats in the world. If you like birding and kayaking, you will love the meandering saltwater streams and tidal creeks here. The next village going down Cape is Eastham. 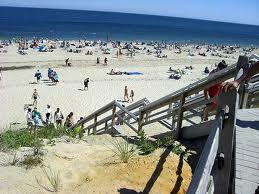 Known as the Gateway to Cape Cod National Seashore, this town also sits between Cape Cod Bay and the Atlantic Ocean. Two very popular Cape beaches, Coast Guard Beach and Nauset Beach, are here. It is also home to Nauset Light, which flashes its’ red and white beams across the beach and out to sea. You can venture inland to historic Windmill Green where you may tour the windmill during the summer months. On the Cape Cod Bay side of Eastham is First Encounter Beach, where in 1620 the Mayflower explorers first encountered the natives. While in Eastham, make sure you stop at the Salt Pond Visitors Center. This is the main visitors’ center for the Cape Cod National Seashore. You will love the museum, the bookstore, and the spectacular view. While in Eastham, be sure to ask a local about Eastham Turnips. Next stop Wellfleet, appropriately know as “the gallery town.” Any day of the week gallery-hopping in Wellfleet is a joy. However, during the summer months, Saturday is officially “Gallery Night.” Just about every gallery in town is open from 6 – 8 pm on Saturday evenings and you will see just about everybody in town as you stroll from place to place. Wellfleet exudes seaside charm. The town clock in the steeple of the First Congregational Church on Main Street is the only clock in the world that strikes on ship’s time. If beaches are your thing, there are 5 ocean ones here: Newcomb Hollow, Cahoon Hollow, White Crest, Maguire’s Landing and Marconi. For those who prefer more tranquil waters, there are Indian Neck, Burton Baker, Mayo, Powers Landing, and Duck Harbor beaches on Cape Cod Bay. It’s actually rather surprising that Wellfleet isn’t known as the “Beach Town.” You can watch beautiful sunrises on the ocean side of Wellfleet and breathtaking sunsets on the Cape Cod Bay side. Moving on down the road you encounter Truro, once known as Dangerfield because of its treacherous coastline. Its' unspoiled woods and dunes have been a draw for artists and writers alike. This is due in no small part to the fact that the Cape Cod National Seashore stretches up its’ eastern shoreline. Wild and beautiful, Truro is home to the famed Center for the Arts at Castle Hill, which draws folks from across the country to take summer art classes. Be sure to visit Truro Vineyards for a taste of locally-made wine. Sitting on the very tip of Cape Cod is Provincetown, perhaps the most famous town on Cape Cod (with the possible exception of Hyannis Port of Kennedy fame). How do you describe P’town (as it is called by locals). It is historic, cultural, diverse, cosmopolitan, quaint, and just plain fun. Enjoy amazing local cuisine, stroll through art galleries and quaint shops, climb the Pilgrim Monument (the tallest granite structure in the United States) for stunning panoramic view, walk on the beach, visit Race Point Lighthouse, go Whale Watching…and have a great time! The intent of this blog, and the ones covering the Upper Cape and Mid Cape, is to give potential visitors some idea of just how large and diverse Cape Cod is. And, we haven’t yet covered the islands of Nantucket and Martha’s Vineyard. Each of those will be covered in upcoming blogs. When planning your visit to Cape Cod, think about staying long enough to really experience this beautiful part of the country. Come stay at our Sandwich bed and breakfast and book our “2011 Special.” It makes an extended stay very affordable and we would love to have you.